I’ve had the most restorative week in the Netherlands. 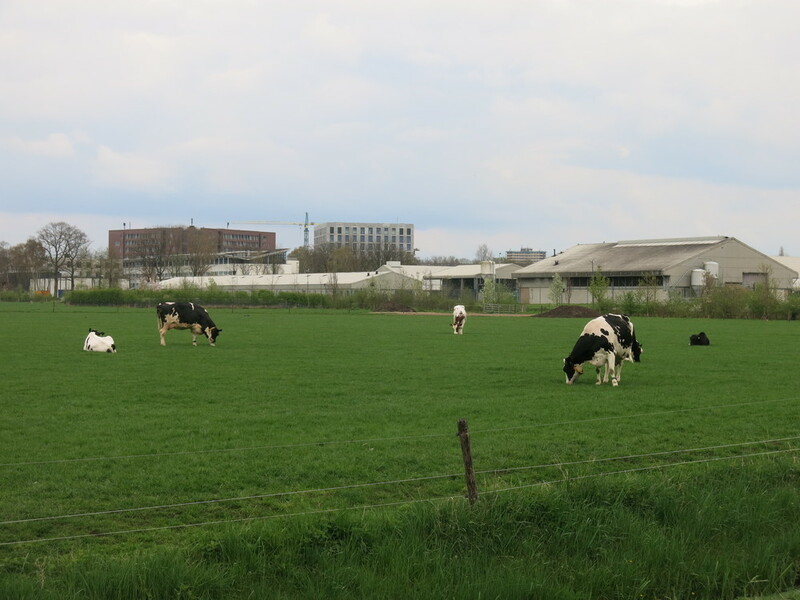 The Dutch are doing many things right: particularly in regards to how we care for our home planet. Do right by Earth and you automatically do right by your life. My faith in humankind has been reaffirmed. First and foremost, the weather was absolutely splendid. Sunshine on all but one day. Open-toe shoes. Mild temperatures. Birdsong all day. Walking and bike paths galore. Al fresco meals. What’s not to love? 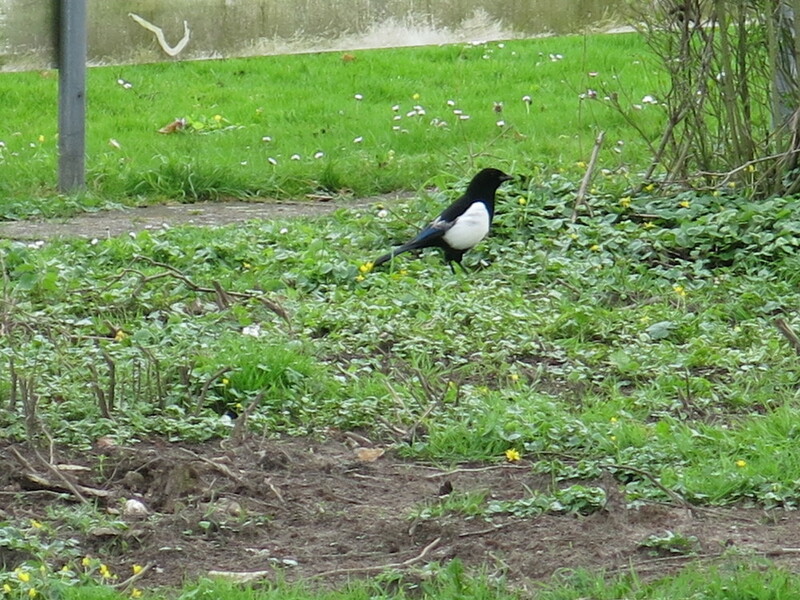 The amount of avian activity I observed was unparalleled. 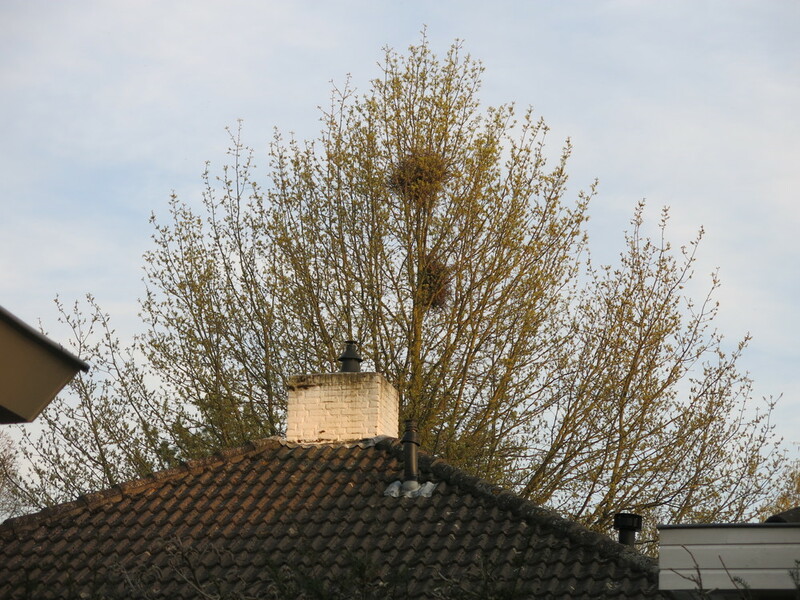 I’ve never seen so many nests and nesting birds in any one place before. And this was not in special preserves or gardens. They were all over! In bustling towns, by highways and of course suburban areas. I walked by one townhouse that had a notice by its mailbox informing the mailman that there was nest inside so could the mail please be placed in the box provided on the ground. I regret not taking a photo of it. Yet, that’s not to say that the number of certain bird species hasn’t dropped over time. Loss of habitat, pollution, climate change have all played a part. However, this country is taking action to remedy and restore. The citizens are more aware and responding positively to fiercely protecting their wildlife. Recycling everything is standard practice across the country. Even compostables are collected weekly and turned into community compost. As a result, ‘gray’ refuse ( actual garbage) is much smaller. The use of clothes dryers is low and instead, clothes are hung out to dry. Electricity is costly and as we all know, dryers guzzle energy. So, despite the typical damp weather in Holland, most folk prefer to ‘air dry’ their clothes. In general, attics and balconeys are reserved for line drying when the weather is inclement. Being conscious of cost, consumption and consequence leads to corrective courses. Knowledge is indeed power. I liked noting that some tried and true practices are still in place. As I mentioned last week, new technology or focusing on the bottom line is not always progress or a step in the right direction. We have to question, weigh the pros and cons before we choose our action. Case in point, if you can walk or bike safely to work or shop, then why drive? There are simple playgrounds everywhere. Wherever one lives, there is a playground near by. So families can get to them easily. No planning a special trip and piling into cars necessary. 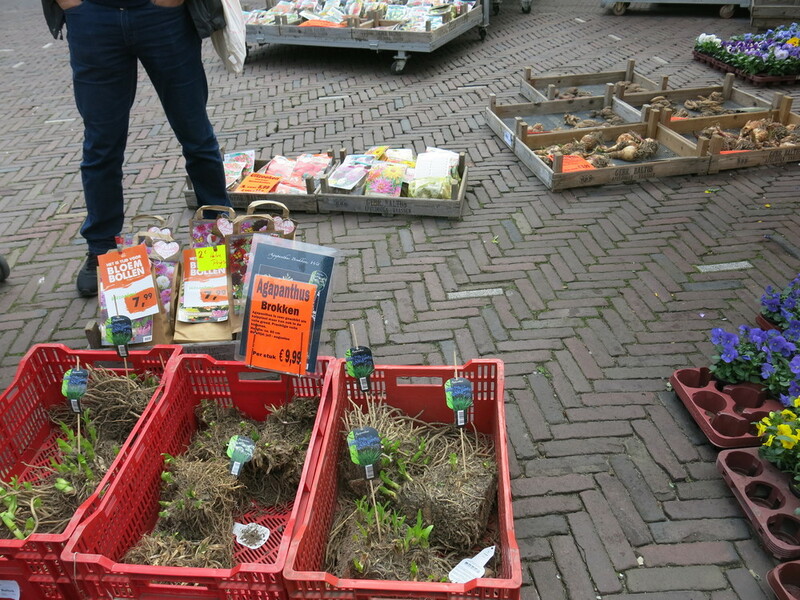 For the most part, Dutch gardens are small. 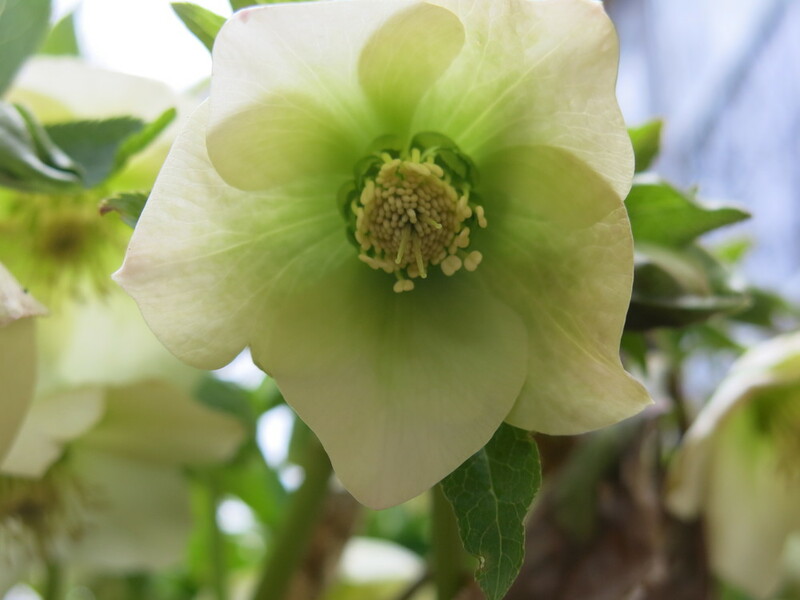 They are intensively and diversely planted. 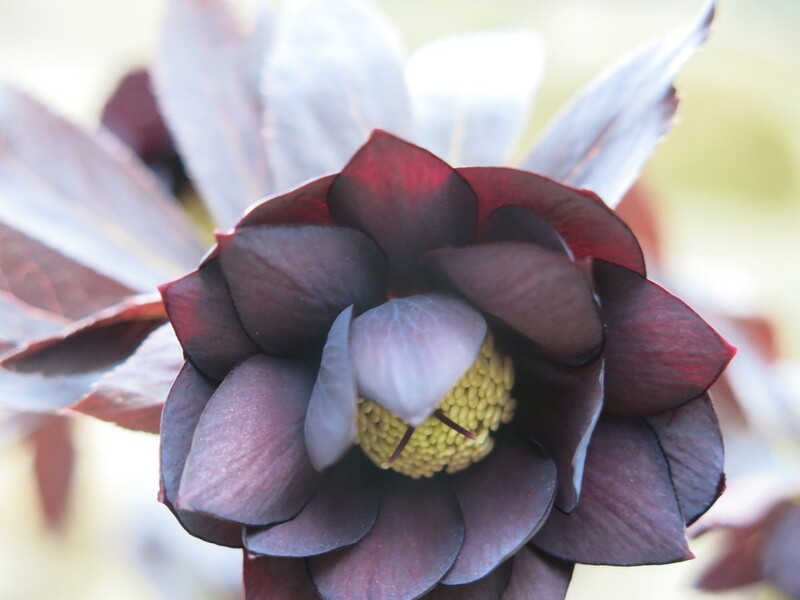 Contrary to the worldwide impression that tulips and other bulbs are ubiquitous fixtures in every corner of Holland, the private gardens are full of plants and trees that reflect the individual personalities and preferences of the gardeners. 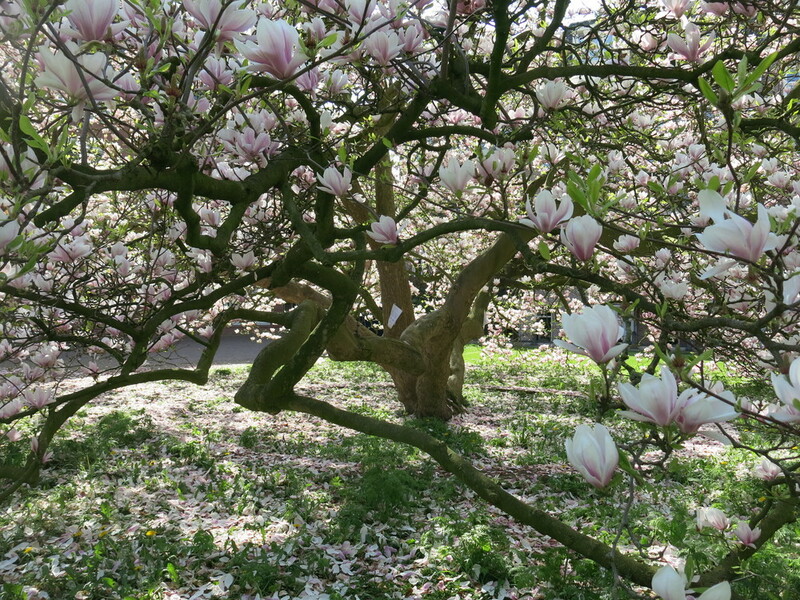 Magnolias were at peak during my visit. The pears had just begun. 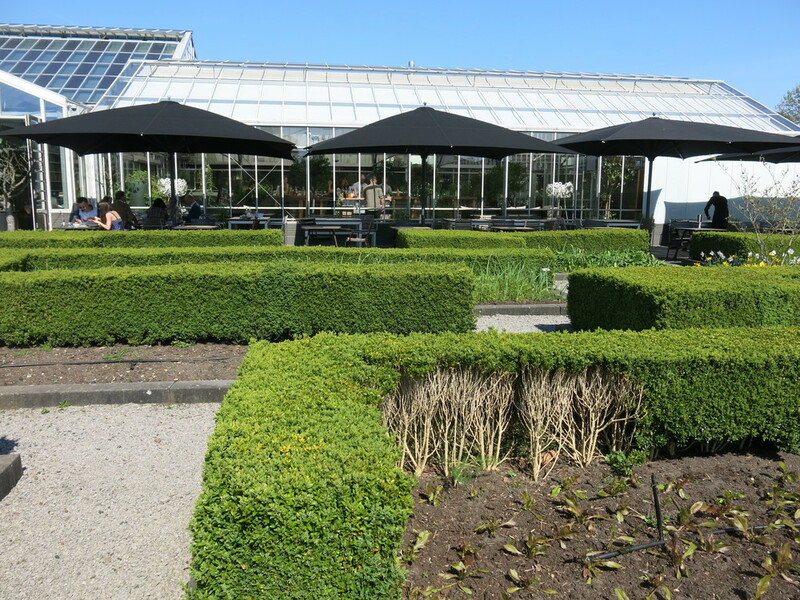 Plants really thrive in the Dutch climate – makes me kinda envious. Lush, neat and green are the hallmarks of their gardens. 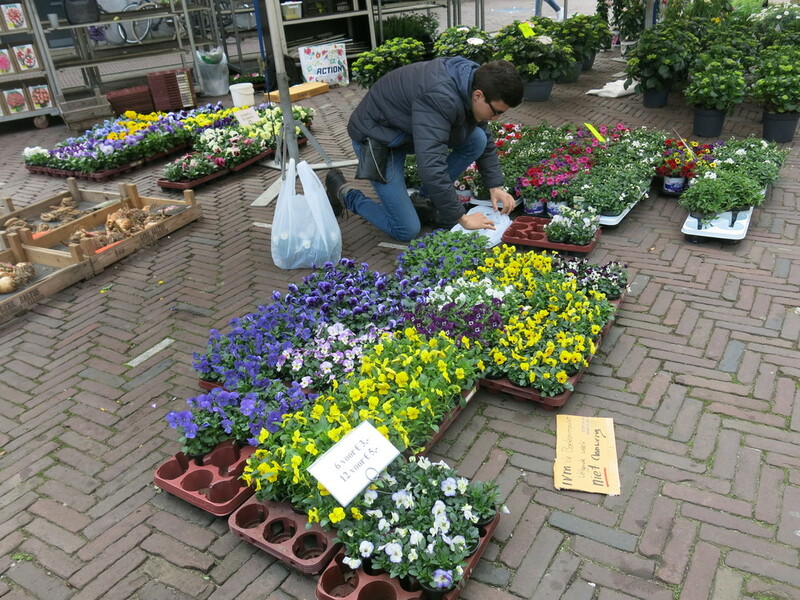 At the weekly, local markets, the flowers and plants available made me absolutely crazy. 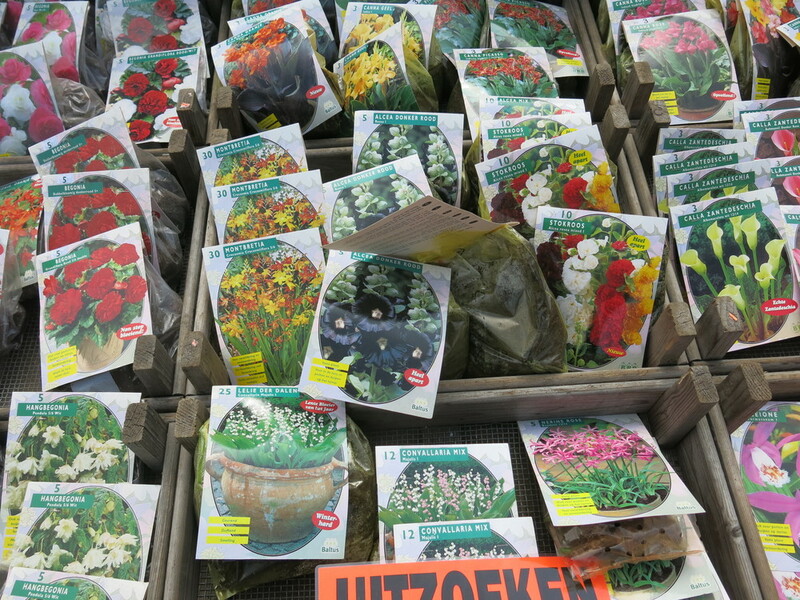 The huge variety, fine quality and low prices had me so frustrated that I couldn’t bring home anything. Finally, I enjoyed a very good lunch at De Kas restaurant in Amsterdam. 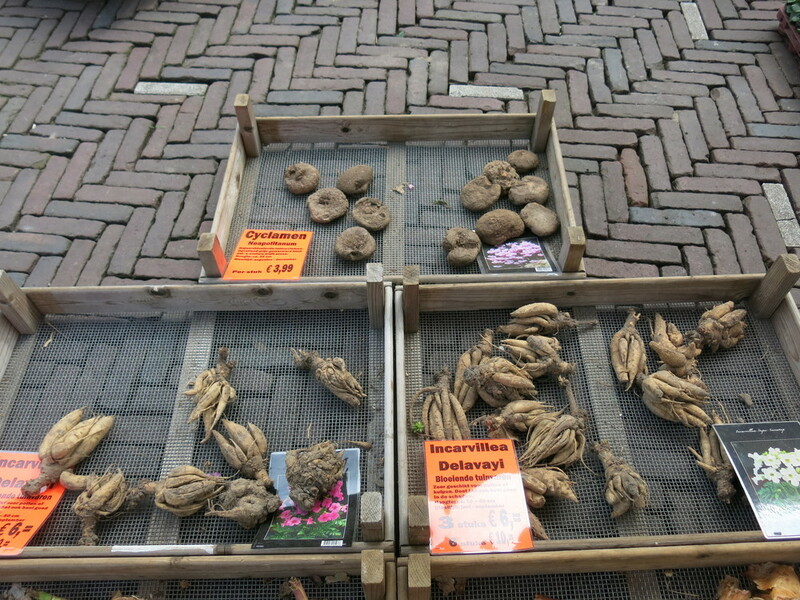 De Kas means greenhouse. 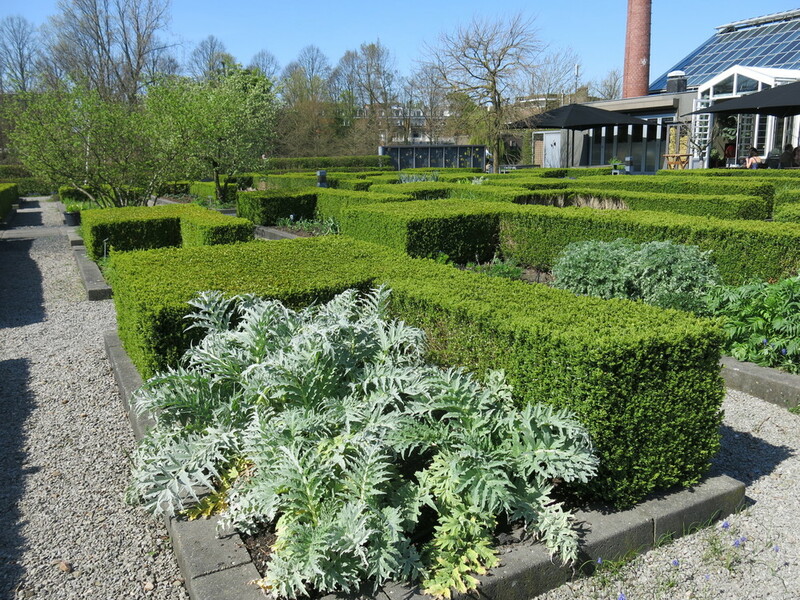 Set in a park in an industrial part of the city, it is an oasis. 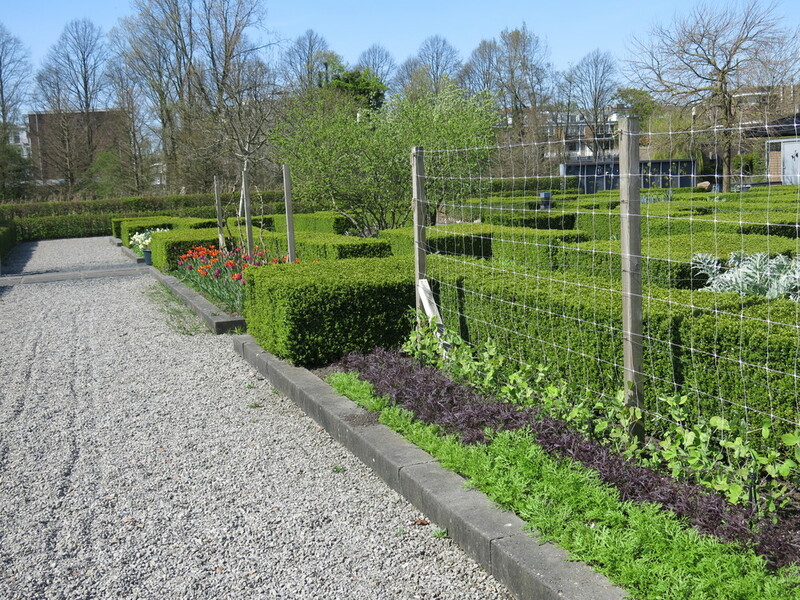 They grow all their produce in a charmingly designed garden and in attached greenhouses. They have additional greenhouses thirty minutes away. Everything is organic and, but for the fish entrée, the fixed menu is vegetarian. Bursting with flavors from an innovative use of herbs and spices, the meal is interesting and satisfying. 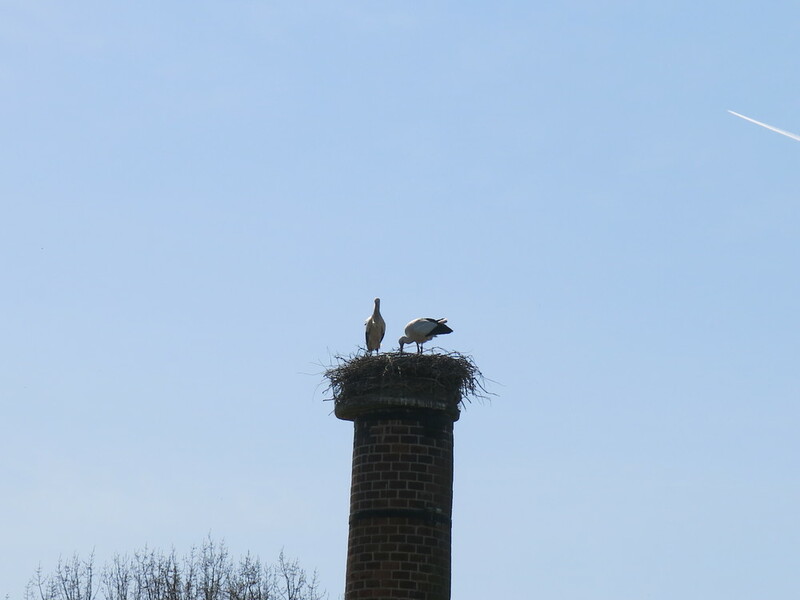 As the weather was so lovely, we sat outdoors on the terrace overlooking the garden and were witness to the flights of birds, cheers of children at play at a playground nearby and, as a real bonus we observed a pair of storks tending to their young in a nest high atop an old, brick chimney left in the park as a testimonial to the industry that used to flourish here. Eat your heart out NatGeo. 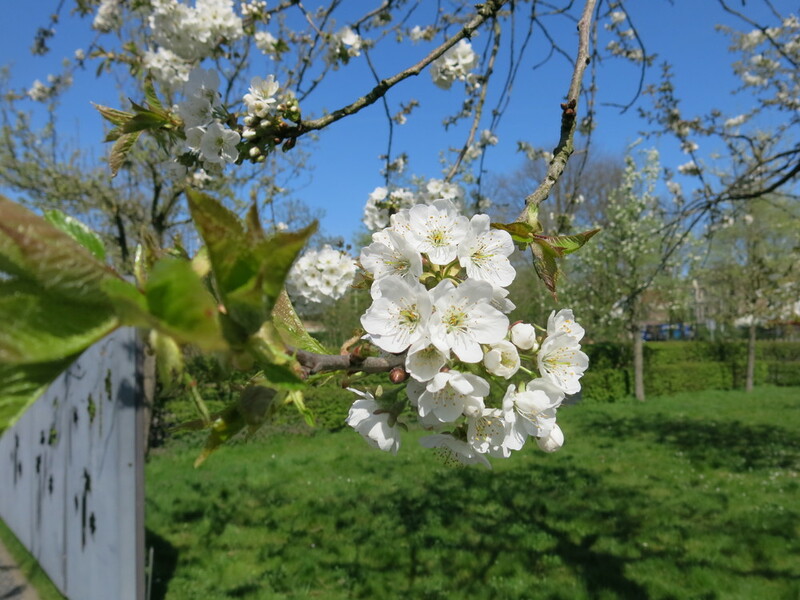 I’m already looking forward to returning to the Netherlands in summer. 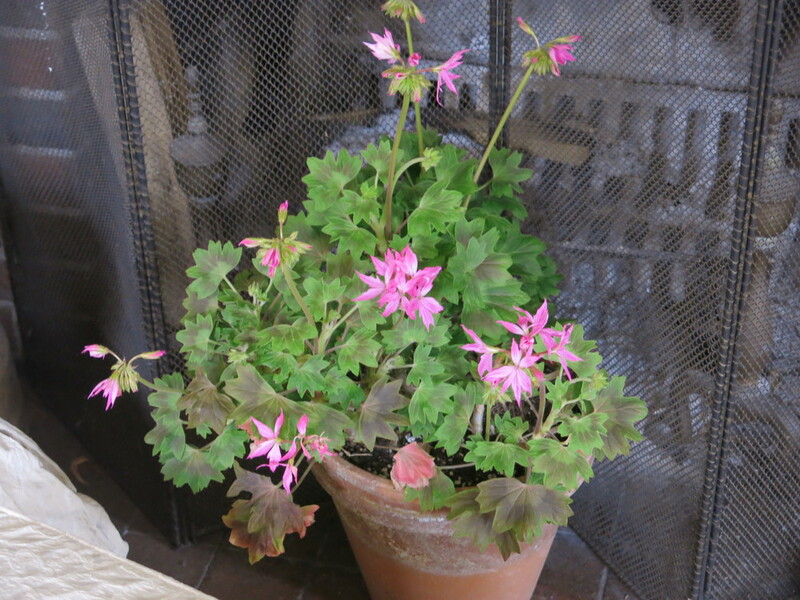 Note: Mark your calenders – I’m a vendor at the PlantFest at Teatown Lake Reservation on May 11 and 12. Just in time for Mother’s Day, hostess, bridal,and wedding showers, birthdays and to spruce up your own home. Do stop by and say hello! My garden’s Open Day cometh! Saturday May 19. 10am – 4pm. 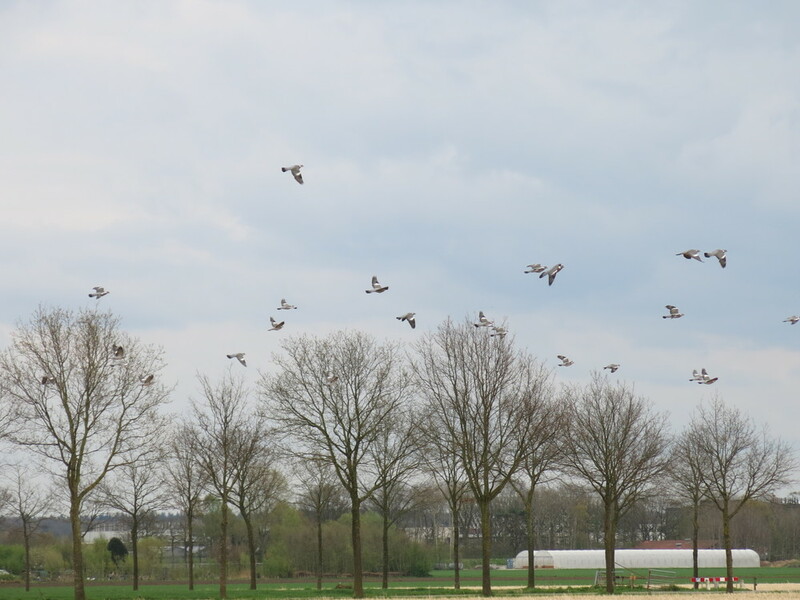 Enjoy these photos from Holland! 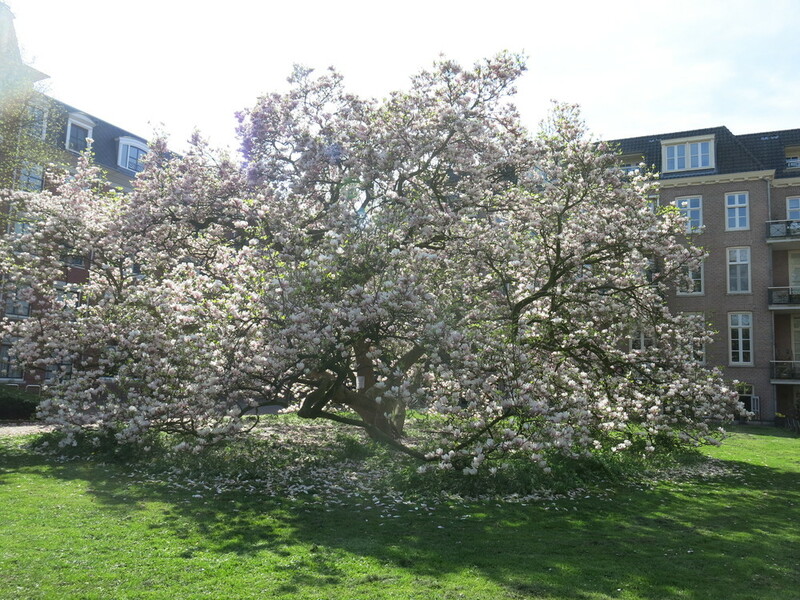 This magnolia tree is three stories high and just as wide. Magnificent. It all started whilst standing in the kitchen at the cooking range – from the corner of my eye I noticed a flurry of activity outside the kitchen window. 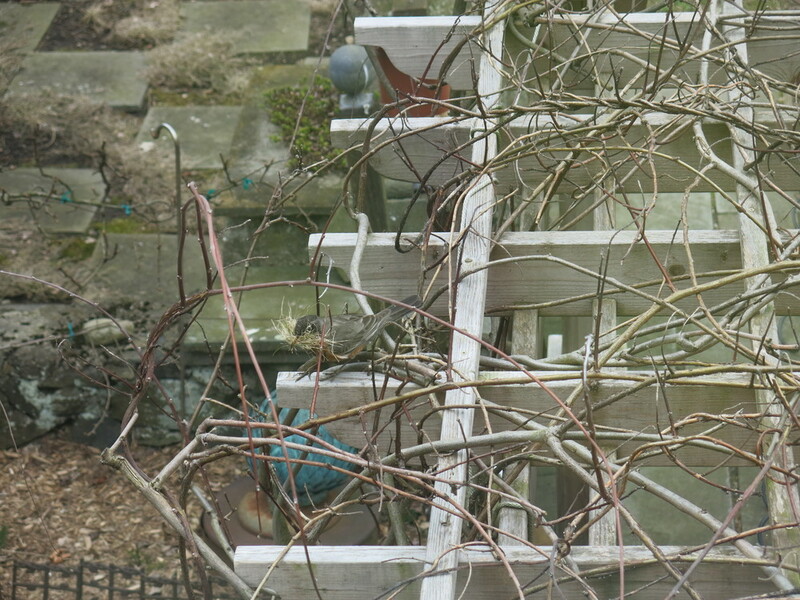 Turning to look, there was a robin with a beak full of fine pieces of twigs hopping around on the pergola directly below. 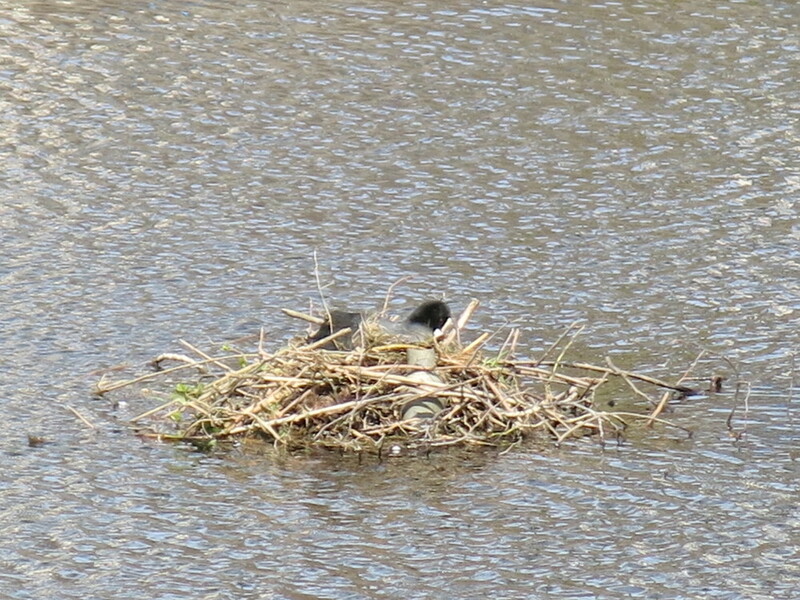 Observing more closely, I spotted the nest. As though sited for my viewing pleasure, it sat nestled in the wisteria branches atop the pergola, giving one a perfect aerial perspective. Oh joy! 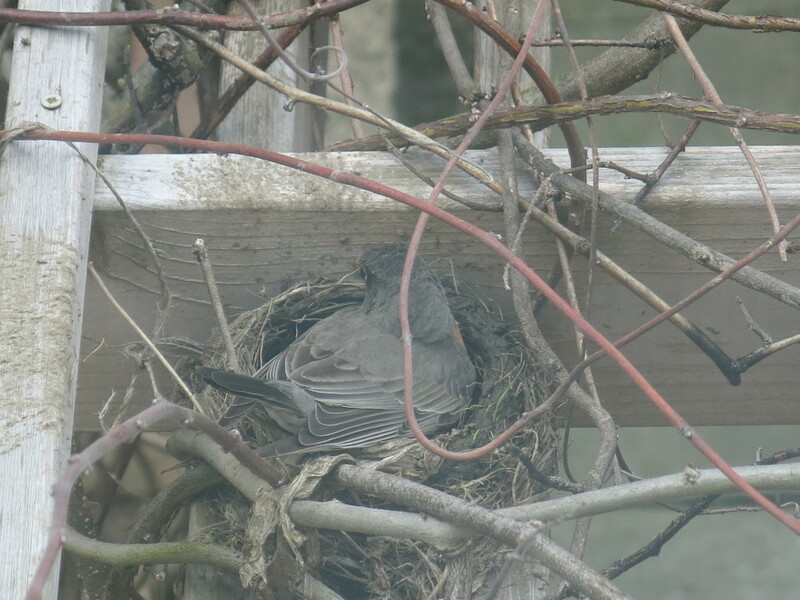 Watching nesting birds is one of my favorite pastimes. Here was that chance like no other. No climbing ladders, straining awkwardly or being stealthy – all that was needed was to stand at the window and look down. 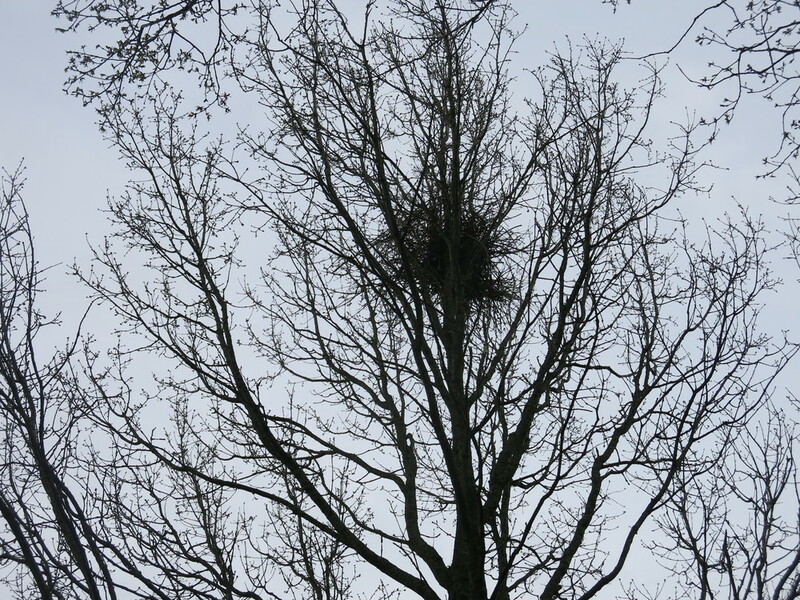 The nest is barely six feet below. Needless to say, this discovery took me completely away from all intentions to get my work done. I was so loathe to leave for my trip to the Netherlands. Throughout my flight there I obsessed about the nest. Was it sited too visibly? Is it too easy for the squirrels o find? Would the afternoon sun hit it too harshly? And how about the rain? With reports of the heavy downpours yesterday, I’m anxious to find out. Oh the worries! I’m due back in a day so thankfully, the wait won’t be too long. 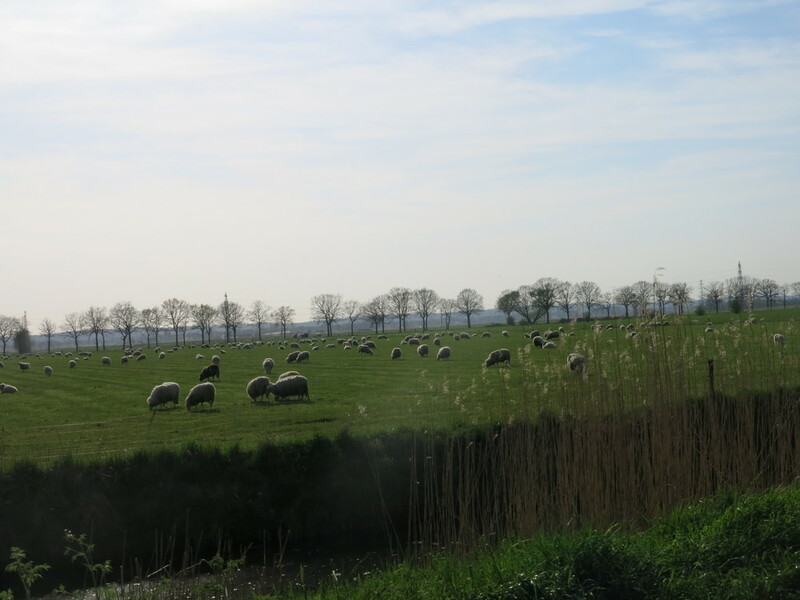 My walks in the Dutch country side have taken me through farmlands where I’m privileged to see cows with calves sticking close to their mamas, sheep with lambs that resemble balls of wool for the taking. 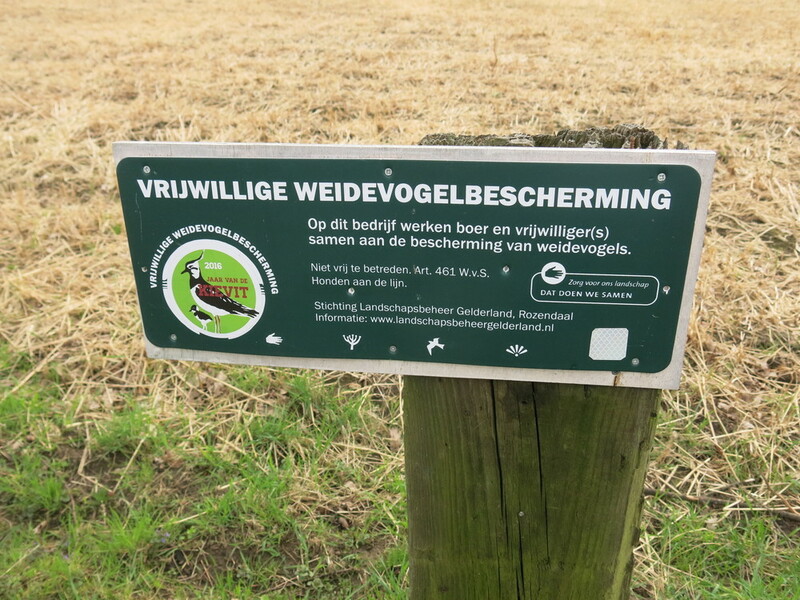 Signs are posted making the public aware the this is an area that farms in a way that protects creatures that nest at ground level. 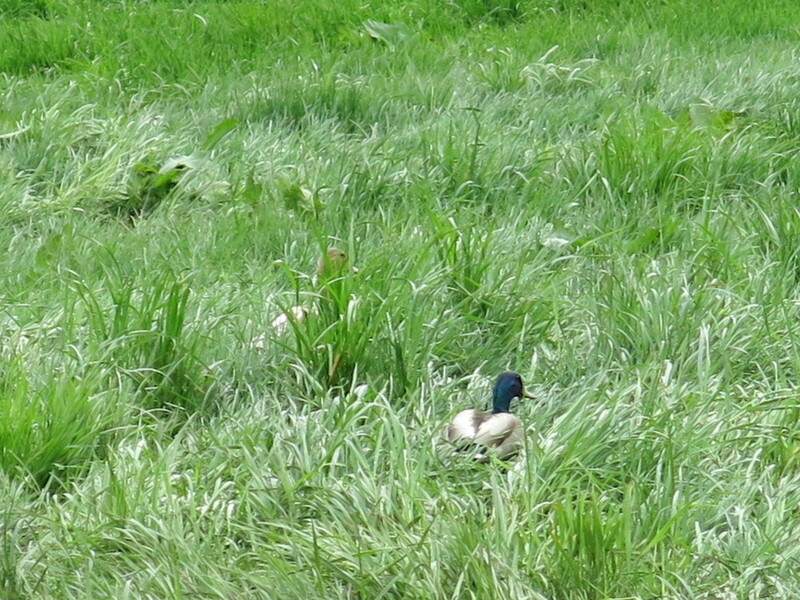 Sure enough, I’ve discerned ducks in grassy fields sitting on what must be clutches of eggs. The farmers do not cut the hay the typical three to four times of the year. Instead, they do so only once. This allows wildlife to flourish. At any given time, some fields are left uncut and other fields are cultivated. Consequently, the yield may not be as high as we have come to expect from modern practices but, it is a comfortable compromise between man and animals. In time I heard enough bird song and became aware of sufficient activity that proved how well this policy was working. Did my heart a world of good. To take up modern ways is not always progress. Certain ancient principals have held up to time. To live and let live is one of them. As I prepare to fly back home, I take with me a fresh resolve to assiduously support the wild life I have come to appreciate and depend upon. 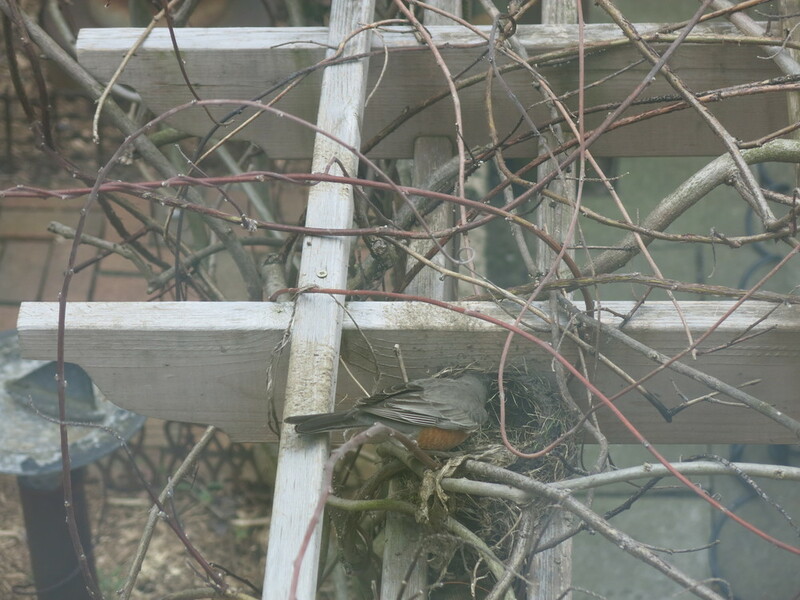 Notice the robin with its beak full? See the nesting duck in this field? It’s finally feeling like spring. A bit. There’s a light mix of snow and rain today but a prediction of sunshine and 70 degrees by Friday. Go figure. At this point, I’ll take it all. 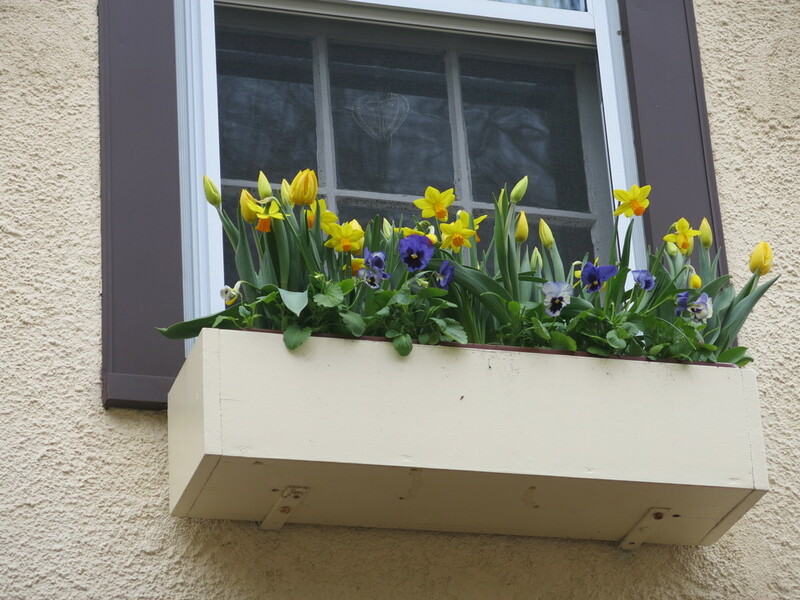 Earlier last week, I tricked myself into spring mode by setting up the window-boxes. 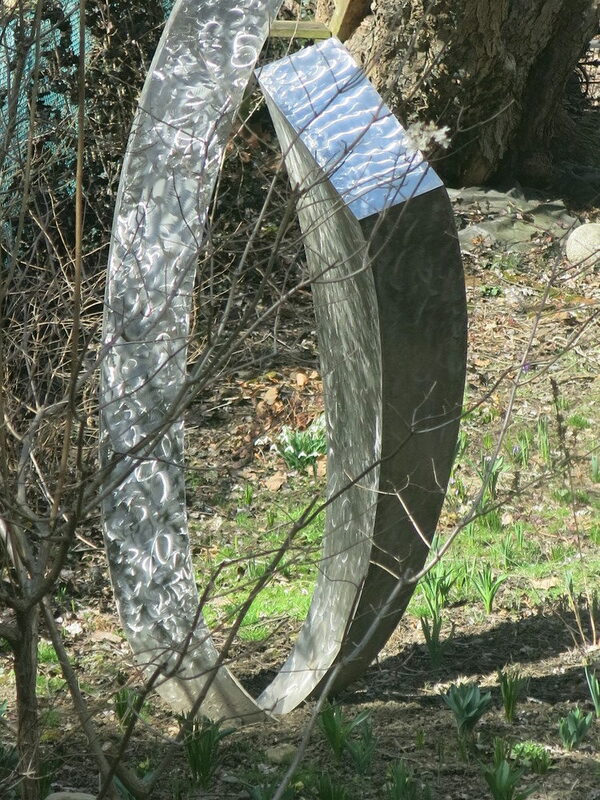 That feature alone cheered up the garden considerably. At ground level, it’s coming up bulbs! 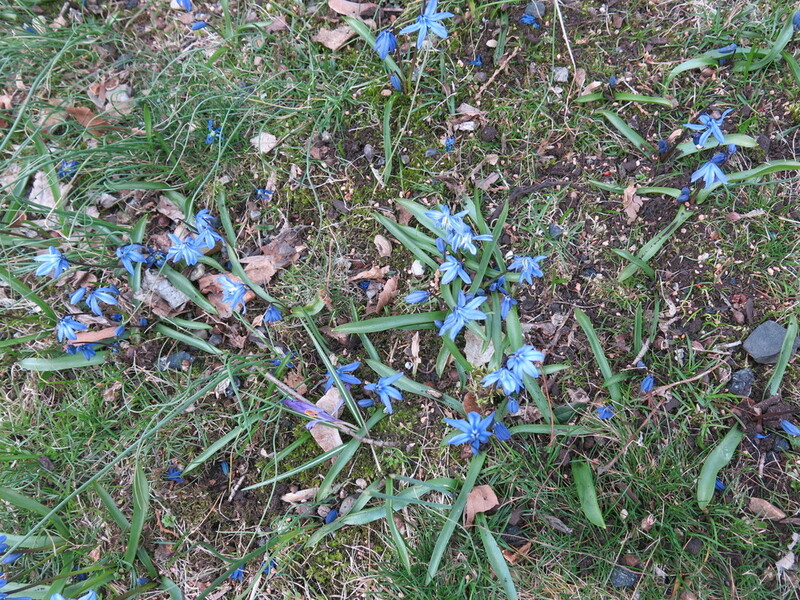 Scillas and crocus have joined the snowdrops and hellebores adding their splash of color that can only be described as celestial. The greening of the earth must be one of the most uplifting events in life. 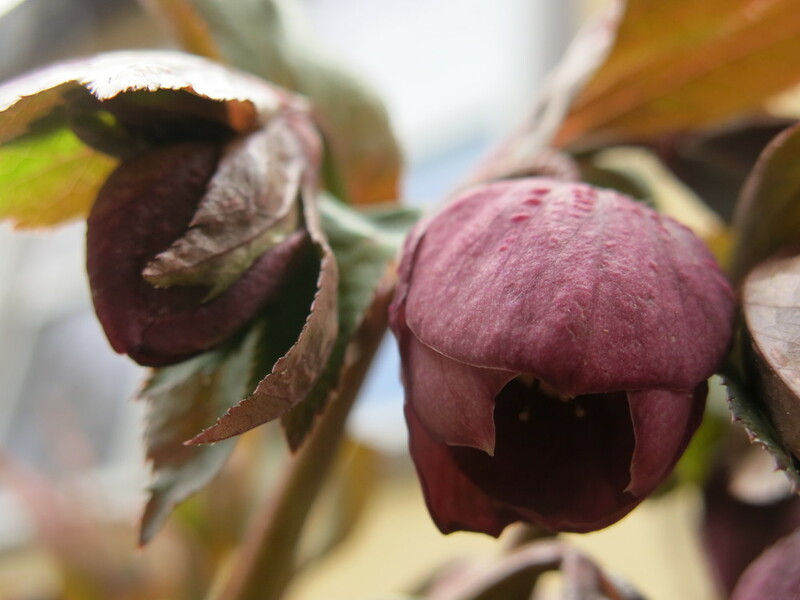 The other bulbs have pierced and pushed through setting themselves up for a chorus of flowers in due course. Pure joy. The pruning and dormant oil treatment has been completed. The ‘lawn’ in front was reseeded wherever it looked winter weary and the whole area has been indulged with a layer of compost this past Sunday. The vegetable plot was also fed with compost and planted up with young leafy greens. It feels so good to be gardening again. While many other tasks remain to be done, the progress made thus far has buoyed my spirits. It never fails to amaze me how even a little time spent working in the garden can effect such a positive outlook. Very soon we’ll be working overtime and at double-speed to catch up on all the chores. Remember, Open Day cometh May 19! In a couple of days, I’m off to the Netherlands for a quick visit. It’s hard to go away right now because I’m loathe to miss even a moment as my garden awakens but, it’s high tulip season there so I expect to be delighted and inspired. Already I can’t wait to return home full of ideas and creativity. ancient rituals timeless and true. 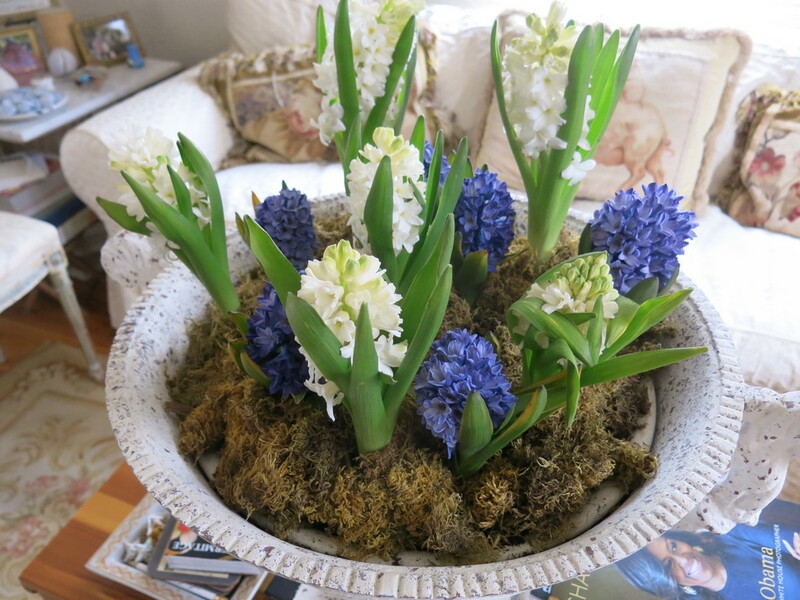 Note: In keeping with the season – Spring sprucing, Mother’s Day, bridal showers, weddings and parties are coming up. Plan ahead. Check out Shop for gifts – note cards, The Printed Garden Collection of pillows, tea towels, napkins, placemats and runners. All profits help educate children with HIV at the Mukta Jivan orphanage.